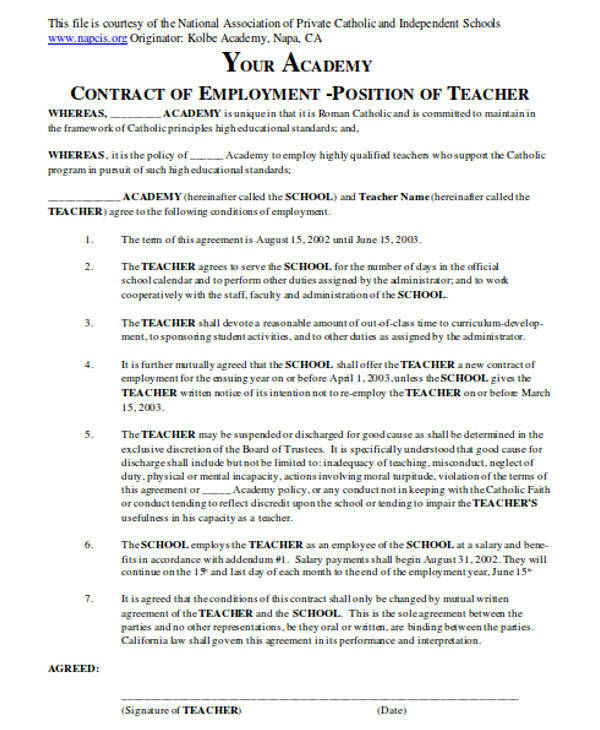 When a teacher is about to engage in a professional relationship with an academic institution, a contract should be signed. A teacher contract is basically a formal agreement between the teacher and the academic institution that outlines all the conditions and provisions that are related to the duties and responsibilities that the teacher will undertake once he/she is an official employee of the school. Academic institutions are highly likely to provide these documents as they are legally binding and can help to protect the rights of both the school and the teacher. 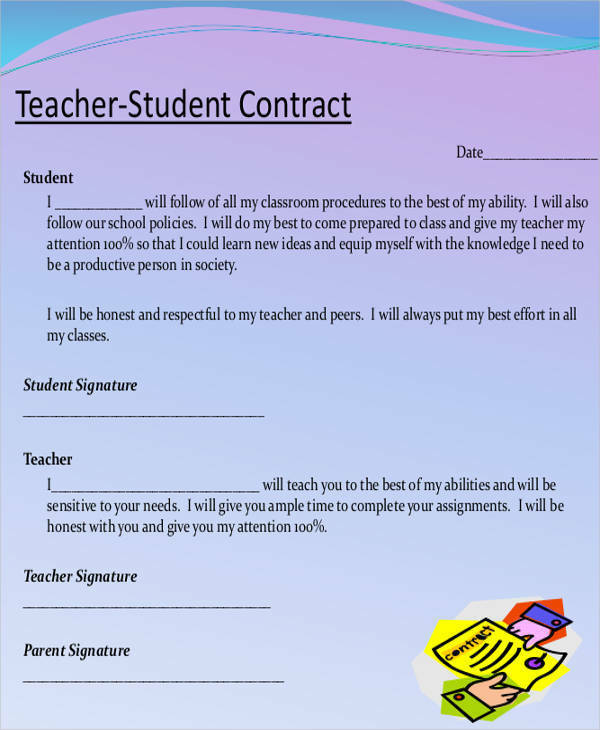 The contracts are usually applicable the very moment the teacher decides to affix his/her signature, which is an indication that he/she agrees to what is stipulated in the contract. If you are looking for high quality and free contract templates, we have 15 samples that you can download and use as reference on this very article. 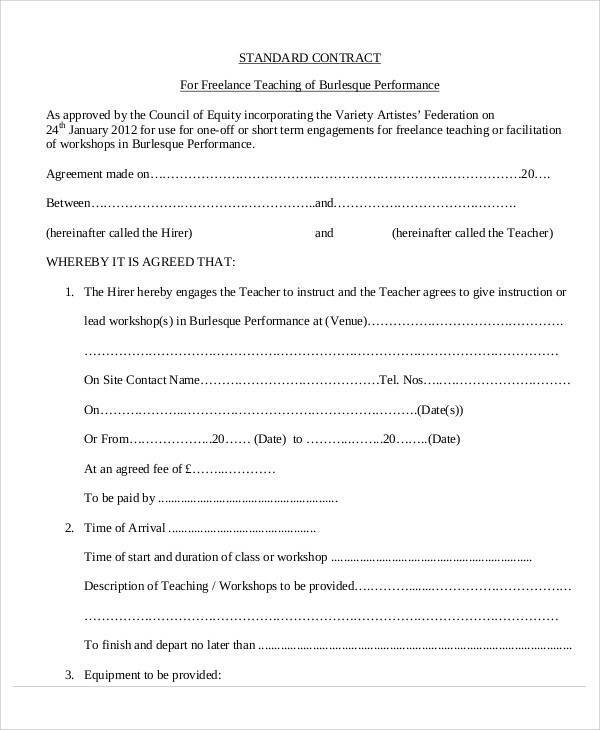 The samples that we have put together follow the standard format for teacher contracts. 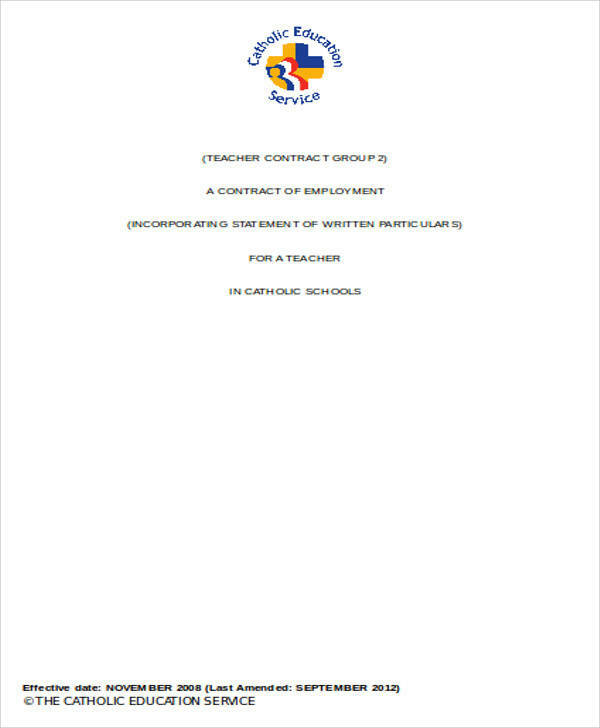 Plus, we also have a few guidelines and tips that will help you come up with a contract that has all the details that the teacher needs to know about his/her employment in the institution. So, what are you waiting for? 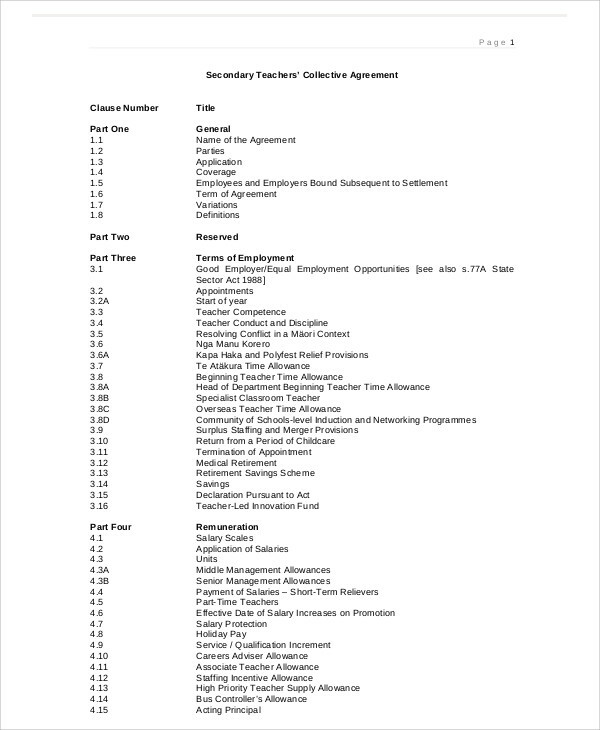 It is time for you to keep reading to find out more about teacher contracts and have an easier time coming up with what you need to include in those contracts. 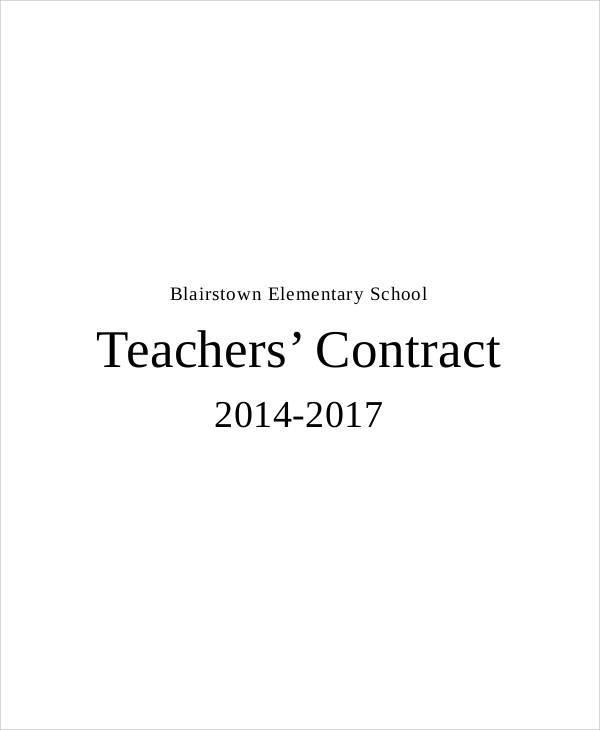 What Can You Find in a Teacher Contract? Details about the Parties Involved. 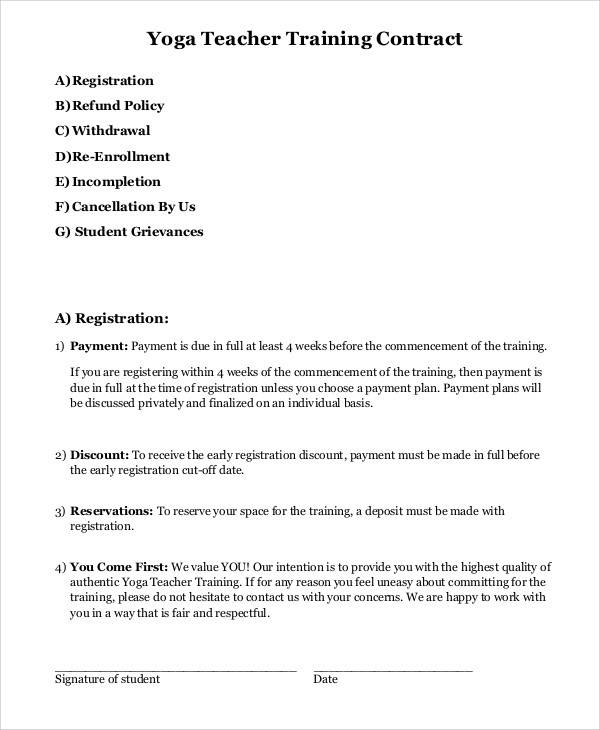 A portion where the teacher and the academic institution will be identified in the contract. This is important as this is going to be the confirmation of the person’s position and role in the academic institution. Most of the time, the academic institution will be identified as the Governing Body while the teacher will simply be identified as The Teacher. Job Appointment Details. This will include the job title and the nature of the job he/she has been assigned to. Commencement of Employment. This will discuss when the teacher will start reporting to the school. The Terms and Conditions. This part of the contract that will outline the rules and regulations that the employee should abide by in order to avoid jeopardizing his/her career. Plus, this is also where the institution will specify the amount of time that the contract will be valid. Business Address/Place of Work. This will outline where the school is located. It will also discuss about relocation plans if there are any and if applicable. Working Hours. This will highlight when the teacher should report to school and the amount of time that the teacher is supposed to render on a daily or weekly basis. Compensation, Benefits, and Insurance. 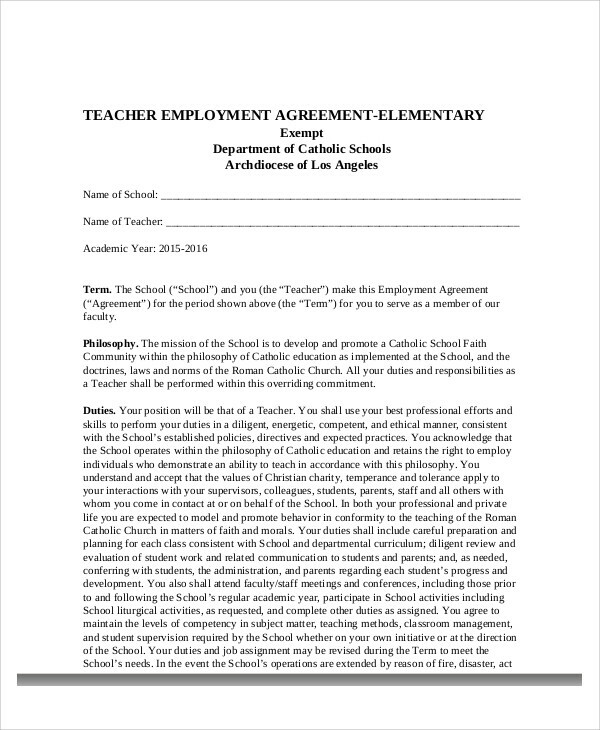 This is going to be the part of the contract that highlights how the employee will get his/her salary, the basic salary, the frequency of salary, and the benefits that the teacher will be entitled to during his/her employment in the academic institution. It will also discuss when the teacher will be eligible for medical insurance and what the medical insurance will cover. Another matter that might be discussed is whether or not the teacher is entitled to overtime pay. Leaves. This will include vacation leaves and sick leaves, as well as how many of each type of leaves the teacher is entitled to. It will also discuss how the teacher is supposed to file for the leaves and that the academic institution holds the rights to approve and disapprove request for leave. Objectives of the Employment. 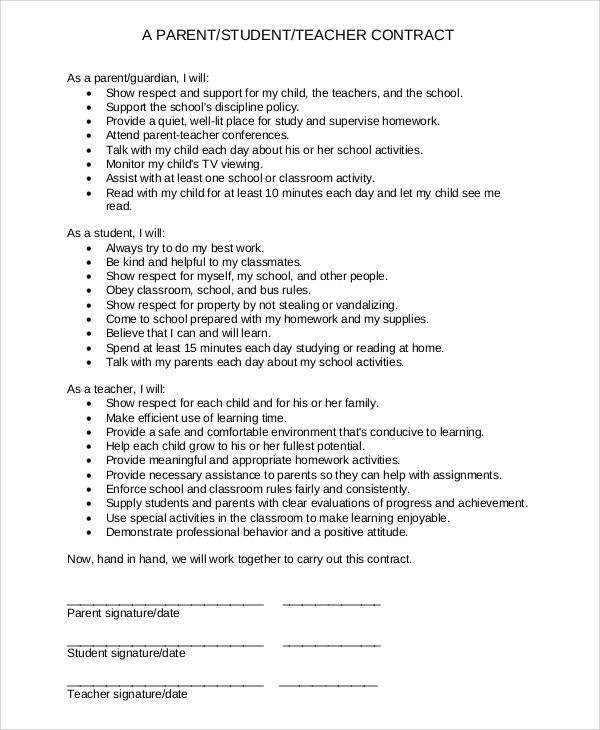 This is the part of the contract that will outline the main objective of the teacher and what his/her purpose in school is. This is also where academic and non-academic activities that the teacher will need to perform during his/her employment in the company. This includes duties and responsibilities during field trips, seminars, extracurricular activities, and other student activities administrated by the school. Another thing that may be outlined in this part of the contract will be coordination between co-faculty members, staff of the school, and the administrators. Provisions for Early Contract Termination. 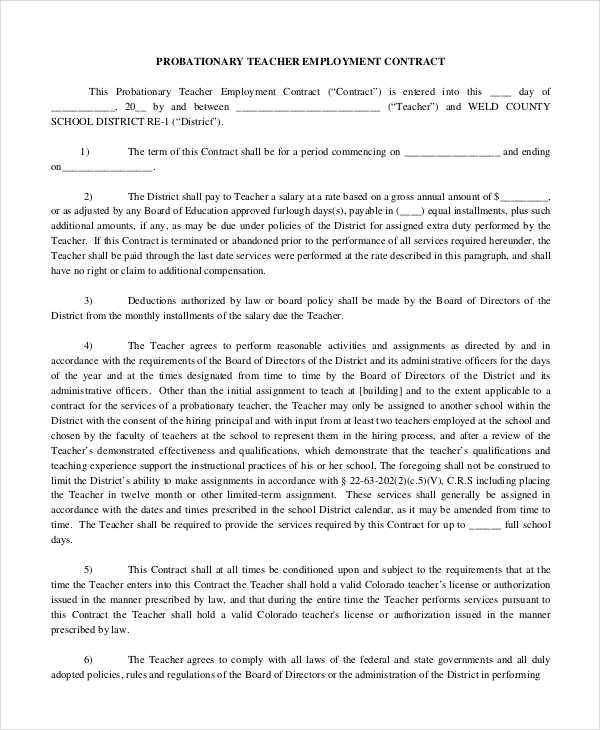 This is the part of the contract where it will be highlighted what are the due consequences if the teacher chooses to terminate the contract earlier than expected. In which case, an employee might need to provide an early contract termination letter that will give out the reasons why there is a need for him/her to terminate the contract. Employment contracts are vital for whatever employment reason there might be and for whatever position it may be. An agreement contract will be the formal proof of employment in writing that binds both the academic institution and the teacher. It helps to clearly define the conditions about the employment. 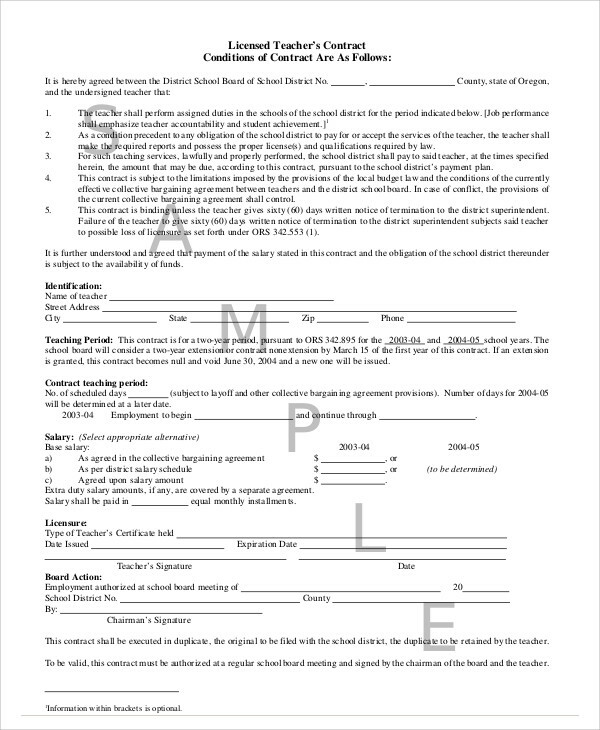 Disputes with regards to the teacher’s employment can also be prevented because a signed teacher contract is an indication that both parties have been made aware of the duties and responsibilities that they have for each other and that needs to be fulfilled. A ton of times, academic institutions have their own mission and vision statements that they have established for a long time. They have been drafted to be the guiding principle they have in terms of how they want the students that enroll with them are educated. This where a lot of teacher contracts are based on as these help to maintain the honor and excellence that the academic institution upholds regarding the education of their students. 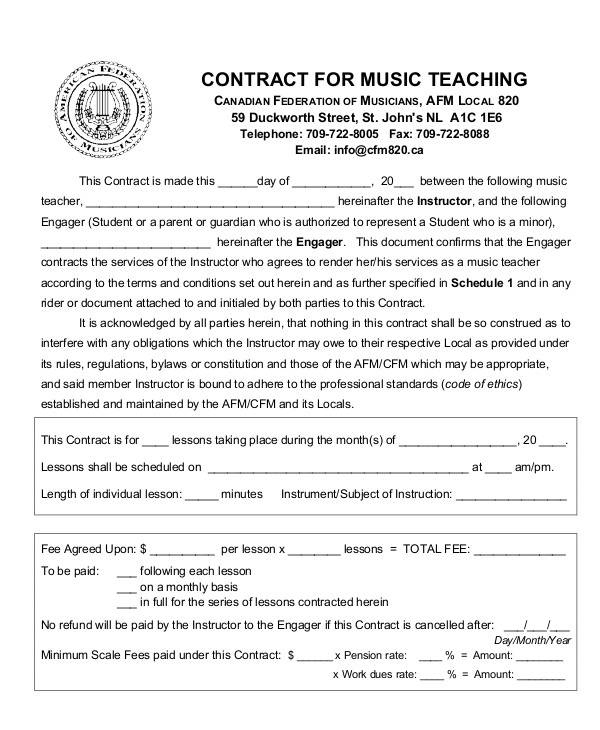 Pick out the sample or samples that you would like to use as a reference to making your very own teacher contract. You can find a green DOWNLOAD button beside the sample you have chosen. Once you click on it, you will notice that it has now turned into a red VERIFY button. Above the VERIFY button, you will find a text box where you will need to input a captcha to verify that you are not a robot. Once you have entered the correct captcha, just click on the VERIFY button. You will now notice that the red VERIFY button is now a red DOWNLOAD button. Simply click on the red DOWNLOAD button and you are now ready to save the file or files you have chosen on whatever device you choose to save the file into. There you have it! You now have the sample contract templates that you can use as a reference. See how easy that was to download? What is more awesome about the samples that we have for you? They can all be downloaded free of charge! Yes, you read that right! They can be downloaded without worrying about having to pay any fees just to get your hands on good quality examples for reference. We believe that you now know the basic elements that you need to include in a teacher contract. To give a quick recap, here’s what we have shared with you in this article. 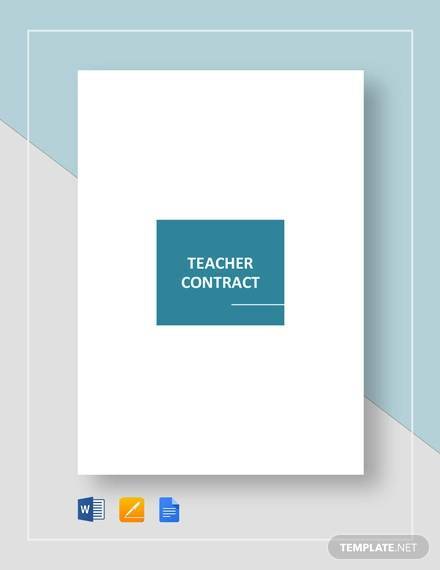 A teacher contract is a legal document used by academic institutions to let the teachers they will be employing know what they need to cover during their employment in the school. 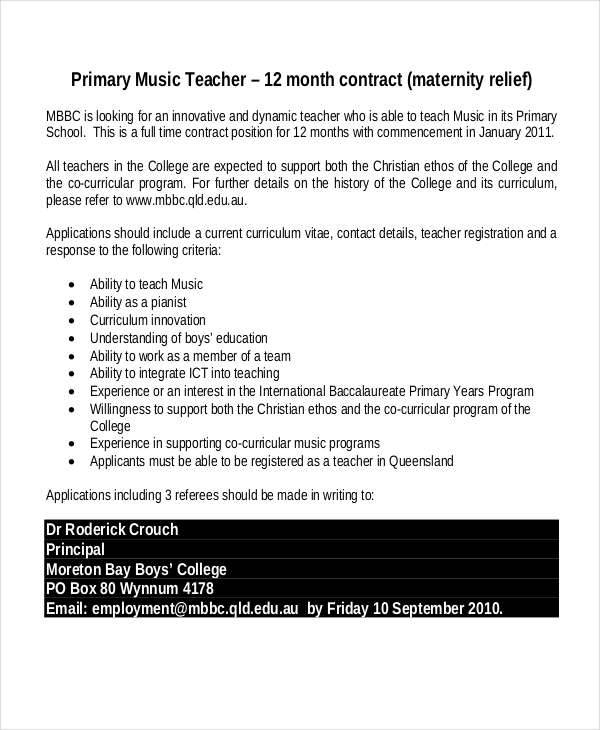 The reason/s why a teacher employment contract is deemed to be important. 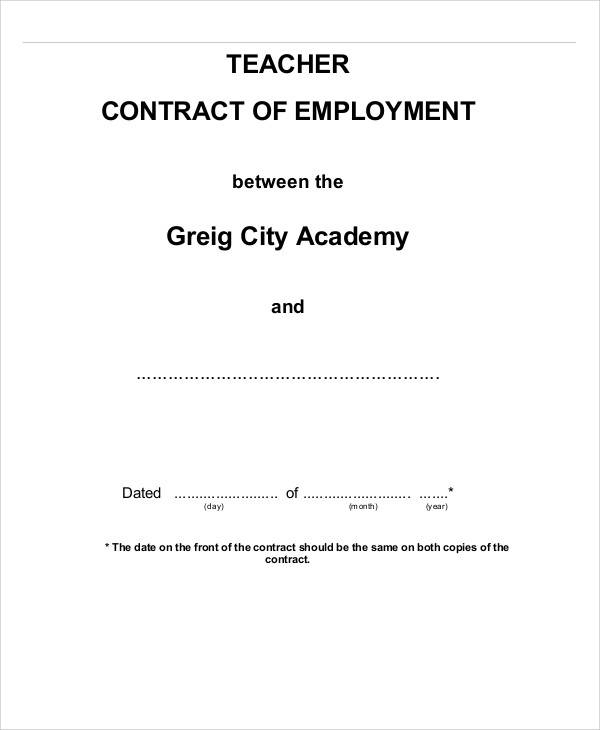 You can find out more about teacher contracts by reading up on what you need to know about employment contracts.